The idea of Rang De was sown in the year 2006, the same year that Professor Muhammad Yunus and the Grameen Bank were jointly awarded the Nobel Peace Prize for “for their efforts to create economic and social development from below”. The motivation for starting Rang De was the belief that philanthropic capital could be leveraged to lower the cost of microcredit for those who require the most. 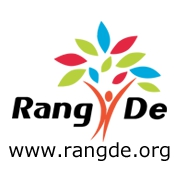 Rang De believes that it can overcome poverty in India by helping people become economically self-reliant. The name Rang De draws inspiration from India’s struggle for independence. The words ‘Rang De’ also denote color and exuberance and that is the impact Rang De wants its efforts to have on the people it reaches out to. To make poverty history in India by reaching out to underserved communities through microcredit that has a positive impact on business, education, health and environment of the communities it works with. Rang De strives to do this through a network of committed impact partners and change makers. Rang De and Women on Wings will seek to identify areas of cooperation through which Indian rural social enterprises could be supported to enable them in overall growth in general and growth in jobs for women specific.